Development of an automated multi-stage continuous reactive crystallization system with in- line PATs for high viscosity process. An automated multi-stage continuous reaction system with in-line PATs for a high viscosity reactive crystallization process was developed in the present study. Data acquisition (DAQ) hardware and Labview soft-ware were used as the local control system. A “forward-backward” burst pumping strategy was developed to smoothly transfer the highly viscous hot slurry from one vessel to the next. In addition, a comparative analysis between a plug flow reactor (PFR) and continuous stirred-tank reactors (CSTRs) in series revealed that to achieve the same conversion, the latter would require more volume than the former, but less than a single CSTR. For a second-order reaction, the value of the Damköhler number necessary to achieve conversion of 90.0% in a single CSTR is 90. Thus, it is reasonable to approximate a PFR using CSTRs in series to obtain a high yield with a smaller reaction volume (compared with a single CSTR). As the probes could not be positioned in the hot slurry due to fouling issues, in-line focused beam reflectance measurement (FBRM) and React IR were used to monitor the crystal size and reactant concentration in the vessel containing the cold slurry. E-factors of batch and continuous processes were also compared and the continuous reaction could obtain a lower E-factor because less waste was generated. Pharmaceutical synthesis remains one of the last industrial processes to use “batch” or non-continuous approaches. Conversely, other industries, such as petrochemicals, automobiles, electronics, and food, have moved forward with automated and continuous operations. Pharmaceutical companies generally manufacture the active pharmaceutical ingredient (API) at one company plant, and formulate the API with excipients into the final drug product at a separate plant. It is a fragmented process with a long lead-time and a large plant footprint. 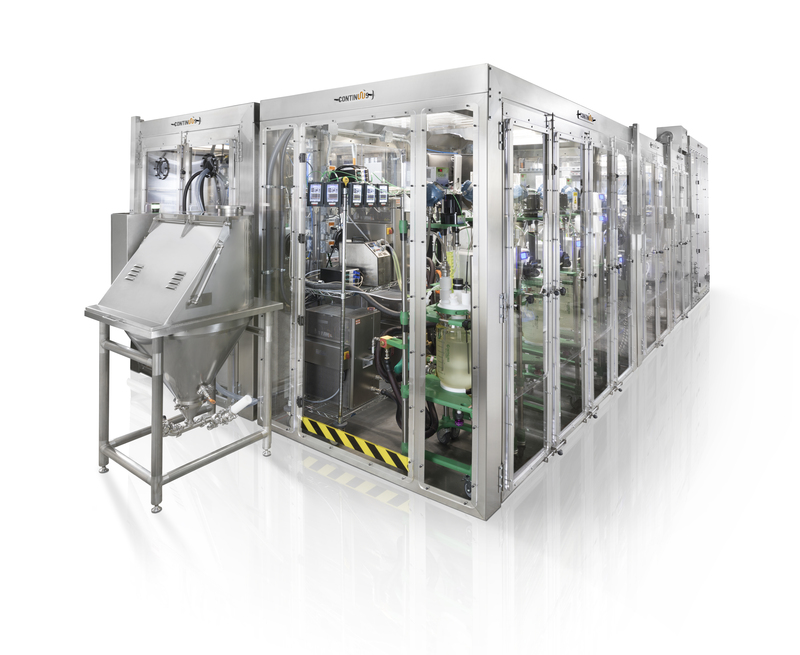 This time-space inefficiency has led to an increased interest in integrated continuous manufacturing (ICM) of APIs and drug products as a seamless end-to-end process. Advantages of continuous manufacturing include: (1) flexibility, (2) speeding up the supply chain, (3) agility and reduced scale-up efforts, (4) real-time quality assurance and better engineered systems, (5) decentralized and individualized manufacturing, (6) reduced footprint and investment costs, and (7) societal benefits. Continuous manufacturing processes of pharmaceuticals can include the following steps: reaction, crystallization, filtration, drying, and hot melt extrusion (HME). Reaction and crystallization are two early stages that occur in the upstream process development in the pharmaceutical industry. Sometimes, reaction and crystallization processes occur simultaneously – this is known as reactive crystallization, or precipitation. 41 The crystallization involves the reaction between reactants to form an intermediate product or end product, which immediately crystallizes out of solution. Reactive crystallization consists of primary processes that occur simultaneously, such as reaction, mass transfer, and rapid nucleation and growth, as well as secondary processes, such as aging, ripening, agglomeration, and breakage. The driving force responsible for crystallization is the generation of supersaturation conditions by the reaction. Therefore, low solubility of the product in the solvent is necessary. Crystallization can affect several quality attributes of drug substances, including size distribution, shape, polymorphic form, and purity. Variations in these attributes may have a significant impact on drug dissolution, bioavailability, efficacy, and, in some cases, safety of the drug product. To produce small mean size particles, high supersaturation with high rates of nucleation is necessary. Reactive crystallization is widely known to produce such levels of supersaturation. Understanding continuous manufacturing processes is necessary to precisely control them. Scientists and engineers working in process development and continuous manufacturing of pharmaceuticals aim to minimize variability in product quality. Process analytical technology (PAT), which is defined by the U.S. Food and Drug Administration (FDA) as “a system for designing, analysing, and controlling manufacturing through timely measurements (i.e., during processing) of critical quality and performance attributes of raw and in-process materials and processes, with the goal of ensuring final product quality”, is key to understanding continuous manufacturing processes. Focused beam reflectance measurement (FBRM), React IR, Raman spectroscopy, and near-infrared spectroscopy (N-IR) are common PATs used in the API manufacturing process. FBRM is a probe-based instrument that is inserted directly into offline samples or in-line continuous processes to track changing particle size and count in real-time at full process concentrations. FBRM has been widely used for the characterization of crystallization systems, including developing and optimizing crystallization processes, tracking and troubleshooting crystallizer systems, and monitoring polymorphic forms. React IR is a real-time, in situ mid-infrared based system, and is designed to study reaction progress and provide specific information about the initiation, conversion, intermediates, and endpoints of a reaction. Raman spectroscopy is a spectroscopic technique used to monitor rotational, vibrational and other low frequency modes, and is commonly used to determine the polymorphic form during a crystallization process. N-IR is a spectroscopic method that uses the near-infrared region of the electromagnetic spectrum, and has been employed both with attenuated total reflection (ATR) probes for solute concentration measurement and without ATR for analyzing API powders and tablets. Green chemistry has become the focus in both academia and industry during the past decade. It is a means to achieve the ultimate common goal: sustainability. A mnemonic, PRODUCTIVELY (prevent waste; renewable materials; omit derivatization steps; degradable chemical products; use safe synthetic methods; catalytic reagents; temperature, pressure ambient; in-process monitoring; very few auxiliary substances; E-factor, maximise feed in product; low toxicity of chemical products; yes, it is safe) was proposed by Poliakoff and co-works to capture the spirit of the twelve principles of green chemistry. The “E-factor”, defined as the mass of the wastes generated relative to the mass of the desired products formed, helps to estimate how “green” a process is. The E-factors for bulk, and fine chemicals industry are <1–5, and 5–>50, respectively. However, for the pharmaceutical industry, the E-factor is usually between 25 and >100. The continuous manufacturing of pharmaceuticals helps to reduce this high E-factor value. In the present work, an automated multi-stage continuous reaction system with in-line PATs was developed. This is particularly relevant for high viscosity reactive crystallization processes, where high solid concentration can lead to transfer line clogging. Therefore, a “forward-backward” pumping strategy was developed to smoothly pump the highly viscous hot slurry from one vessel to the next. The volumes of a PFR and CSTRs in series to obtain a specified conversion were compared. In-line FBRM and React IR were used to monitor the crystal size and reactant concentration during the reactive crystallization process.